I have traditionally been rather sceptic of some of the more innovative new capabilities suggested for the Finnish Defence Forces on Twitter. The issue is usually money, and in particular that with a number of gaping holes in the budget the money available could usually be better spent on more conservative endeavours. Today, however, a rather interesting suggestion appeared. Now, before you (yes, especially you Army officers) move one to more realistic proposals, hear me out on what make this proposal more interesting than, say, a multi-national amphibious division. It is no secret that both Finland and Sweden like airborne movement of light infantry. Sweden have their own airmobile battalion in the 31. Btn of the Life Regiment Hussars K 3, while in Finland several units, including the special jaegers of the Border Guards (who have their own helicopter wing), the paras of the Utti Jaeger Regiment, and the different readiness units spread out over the country, all regularly train with helicopters. The benefits are obvious. A helicopter will get you from point A to point B quickly, especially through rugged terrain the difference compared to ground transport is significant. It also needs a relatively small open space to be able to land on, and the units transported need relatively little training compared to the traditional way of doing vertical movement by parachuting people out of airplanes. Of course there are issues as well. Helicopters are relatively squishy (though not as badly as some of their detractors suggest), and expensive to operate. While the units being transported need relatively little training, crewing the helicopters on the other hand is a very complex and demanding task. This means that there will always be a limited number of helicopters available, while at the same time their utility means that they will always be in high demand. The end-result means that it is risky for any commander to count upon having helicopter support when requested. Both the Finnish and Swedish Defence Forces use the NH90 for tactical transports, with the Swedish Air Force also use the UH-60M Blackhawk in the same role. While Norway operate both the NH90 and the EH 101 Merlin, they are mainly reserved for maritime roles, with the main tactical transport being the venerable Bell 412 SP. While the Bell 412 certainly is a considerable improvement compared to the Vietnam-era UH-1D, it is still a relatively old and light system, hauling a maximum of 11 passengers and an underslung load of 1,500 kg maximum. The Finnish Defence Forces officially states that NH90 is capable of transporting 16 passengers and has an underslung capacity of 3,000 kg, while the Swedish Air Force is happy to cram in an even twenty passengers, or half that number if the soldiers bring their gear with them. This highlights an important point in airborne operations: light infantry don’t travel light, and certainly not if they are planning on doing a lot of fighting. Especially if one starts looking at support weapons or want a serious amount of ammunition and supplies brought along, it quickly becomes evident that ten NH90s or Bell 412s won’t allow for much in the way of Operation Market (though a remake of Operation Deadstick just might be possible). Increasing the number and/or size of helicopters have always been felt as being too expensive, and it is a great irony that only thanks to the serious delays of the NH90-program the Swedish force actually has the largest inventory of medium transports of the three countries. However, there are a few reasons why a tri-nation heavy lift force could work. The utility of even a limited number of heavy-lift helicopters is obvious. Case in point being the famous Chinook Bravo November of the Falklands War, where the single surviving Chinook of the British forces, flew 1,500 troops and 550 tons of cargo during the conflict. Less well-known is the fact that this distinguished old lady is still in active use, and has seen service both in Iraq and Afghanistan, though now upgraded to HC.4 standard. A heavy-lift helicopter is able to significantly add to the combat value of an airmobile unit, either in the form of more soldiers, a single Chinook could lift a platoon of jaegers by itself, or by carrying significantly more supplies to the battlefield. This also includes items too heavy for the NH90, with an underslung load up to and above 10,000 kg being possible (depending on fuel and other cargo). Crucially, while joint-units outside of an alliance are something of a risk, shared transport assets have proved feasible. The Heavy Airlift Wing at Pápa have proved to be a successful concept, and one which all three countries are involved in. While not a one-to-one comparison, a similar-ish setup with say fifteen helicopters spread over the three countries (five national helicopters each) would allow for on average three being operational in each country at any given time, as well as allowing for dry- or wet-lease of the other countries’ assets in times of need. This could include both during international missions, where heavy helicopters are a sought after capability, or during national emergencies such as the large forest fires which plagued Sweden this summer. While operating a small force of heavy helicopters alone would quickly become expensive due to the fixed cost, this kind of shared unit would offer economics of scale, and also provide an excellent building block in case an escalating crisis calls for rapid expansion of airborne capabilities. The CH-47 (there are really only two options, so we’ll just predict that the CH-47F and CH-53K would meet in a fly-off were the former would win) is also everything the NH90 wasn’t, being a tried and tested design supported by a large number of flying units, both in Europe and worldwide. This makes international cooperation (and possible expansion) relatively straightforward and cheap. What are then the pitfalls that need to be avoided for this to work? To begin with there’s always the question of workshare. With the NH90 Patria is a major service hub, and it is entirely possible that other actors would place significant pressure on local politicians in the other countries to ensure that they would get more of the work done domestically. Splitting maintenance and other support functions might mean that the envisioned economics of scale evaporate. An even greater risk is nationalised versions. Very few joint procurements have actually succeeded in producing a situation where the same product is bought by all involved. The nightmare scenario would be one country dropping out, one buying the Chinook, and the other getting the King Stallion. The biggest question is still the hard numbers. Keen readers will have noted that I haven’t mentioned any sums here, as truth be told I am not in a position to estimate the share each country would have to pay to operate a third of a Chinook-unit. It might very well be overly expensive, and would need some serious calculations before any commitments are made. Some funds would have to come from outside the defence budgets, as all countries’ defence forces are on extremely tight budgets already. As the helicopters would be valuable assets for emergency services and as part of disaster relief efforts domestically and internationally, having the ministries of interior and foreign affairs respectively provide part of the funding would likely be a must for this to work. All in all it is a long shot. But it just might be worth looking into. The NH90 was supposed to become the gold-standard of military transport helicopters, utilising composite structures and high-tech avionics to provide a modern workhorse for the airlift needs in a host of European countries. Almost immediately the grand vision hit rough waters, with significant teething troubles and delays. A chapter in itself was the joint Nordic helicopter program, which eventually ended up with the different countries all going more or less their own ways. In the end, Denmark and ordered the larger AW101 (ex-EH101), Norway got both the AW101 and the NH90 NFH (naval version), while Finland ordered the NH90 TTH and Sweden opted for two modified versions of the NH90, designated HKP 14E and 14F locally. In addition to the “baseline” teething troubles experienced by the project as a whole, the Swedes in a highly-publicised move decided that they wanted a higher cabin. This lead to a significant redesign, which brought added costs and delays. In the background also loomed persistent rumors that the evaluation made by the Swedish Defence Forces had been won by another contender (the Sikorsky S-92), and that the NH90 had been bought due to political considerations. While the Finnish helicopter program also suffered delays, at one point forcing the once-retired Mi-8’s back into service, the Finnish Army rather quickly regained their footing. In part thanks to the delays, Patria was negotiated to take a bigger role in the overhaul of not only the Finnish but also of foreign helicopters, and by not requiring all documentation and systems to be fully operational immediately, the Army was able to phase the NH90-fleet into use at a relatively fast pace (still years late compared to the original plan). One of the breakthrough moments was the major exercise Pyörremyrsky 2011, which saw a formation of 9 helicopters perform an airlift operations. A first, also by international standards. In the meantime Sweden was still suffering from issues with regards to the localisation, and the attitude towards incomplete or temporary paperwork was not as forgiving. To make matters more urgent, like in Finland, Sweden was also in the process of retiring their earlier helicopters. In this case, the retirement of the Hkp 10B (Super Puma) meant that the forces in Afghanistan would be without a MEDEVAC helicopter for the foreseeable future, something which was deemed unacceptable. To solve the issue an urgent order for 15 UH-60M Blackhawk was placed in 2011 as a stop-gap solution. Influenced by the troublesome HKP 14 program, the helicopters were ordered according to US standards, with one of the chief programme executives being rumoured to have summed up the order with “I don’t care if it reads ‘US ARMY’ on their sides, just get them here!”. The new Blackhawks provided stellar service in Afghanistan, and once the operation winded down they were integrated into the Swedish Air Force’s Helicopter Wing as part of the medium lift capability of the defence forces. By all accounts the helicopters, locally designated HKP 16, have performed well, and the deal is a prime example of something acquired outside of original plans quickly finding its place in the greater scheme of things. At the same time the transport version HKP 14E was slowly getting introduced into service, but still the critique didn’t let up. The marine version HKP 14F (not to be confused with the international naval version NH90 NFH) was being delayed further until 2015, and entered service both without any kind of anti-submarine torpedo as well as without a working data link to relay information to and from other units. The latest blow came when it was clear that the Air Force had looked into mothballing all nine HKP 14E, due to the extremely high operating costs, over 19,000 EUR per flight hour. At the heart of the issue lies accounting. The majority of the costs does not come from fuel, but from fixed costs such as yearly overhauls. The high cost means that the Air Force prefer to use the Blackhawks whenever possible, as they sport a flight hour cost one-fifth of that of the HKP 14 . This in turns leads to even lower usage for the HKP 14, further pushing up the cost per hour. To make matters worse, there is speculation that part of the fixed costs are depreciation, i.e. accounting for the fact that the value of the helicopter diminishes per year. A handy tool when it comes to calculating investments in regular companies, a not-so-handy one when it comes to defence budgets. This is in stark contrast to the Finnish numbers, where the flight hour cost is on a steady downwards trajectory. For 2017 the budgeted flight hour cost was 15,900 EUR, while for 2018 it is down in the neighborhood of around 10,000 EUR. This was confirmed by colonel Jaro Kesänen, Commanding Officer of Utti Jaeger Regiment which is home to the Helicopter Battalion. Speaking as a private citizen, Kesänen noted in a non-formal Twitter exchange that the NH90 is an appreciated asset in the Finnish Defence Forces and that the flight hour cost is within the range envisioned when the helicopters were acquired. Notable is that in the case of Finland the NH90 is the sole transport helicopter available to the Defence Forces (though a limited number of Border Guard helicopters can also be called upon by the authorities), and the caveat should be made that rarely does the Finnish Defence Forces openly voice negative opinions about their own systems. In the last weeks two major reports on the future of the Swedish Defence Forces have been released. The first was SOU 2018:7 which looked at the long-term needs for new equipment to the Swedish Defence Forces (also known as “Wahlbergs review”). The review looked into mothballing either all HKP 14 or only the army cooperation HKP 14E to make budgetary saving. The conclusions presented was that few to none savings would be made if the HKP 14E was retired, and in case all HKP 14 were retired this would have too large negative effects in the maritime domain. The second report was the Defence Forces’ outlook at how to expand up until 2035 (known as PerP). The report only deals with the Helicopter Wing in passing, and does not mention individual systems. What it does note is identify the need to grow the organisation and its capabilities, in part due to the need for airmobile units. As such, the career of the HKP 14 seems set to continue in the Swedish Defence Forces. Time will tell if it will grow into a beautiful swan, or whether it is destined to stay the ugly duckling of the Helicopter Wing. This year’s main flying event in Finland has just been held in the form of Tour de Sky at Kuopio-Rissala, a joint civilian and military airfield. In the later form, it is home to half of Finland’s fast jets as the legendary 31 Fighter Squadron resides there. Bearing the traditions of the wartime 24 squadron and their Brewsters, post-war the squadron operated the MiG-21 in the F-13 and Bis variants for several decades up until they were withdrawn from Finnish service in 1998. This year the MiG returned in style, with two Romanian MiG-21 LanceR C being present (together with a supporting Alenia G.222), one of which performed a very spirited flying display. The LanceR C was an upgrade program launched by Romanian Aerostar and Israeli avionics company ELBIT, and included amongst other things fitting the aircraft with a modern multimode radar in the form of ELBIT’s EL/M-2032, installing two multi-function displays in the cockpit, and clearing the aircraft for the carriage of new short-range missiles such as Python 3, Magic 2, and R-73. Still, the program was completed in 2002, so even with the upgrades the aircraft is on the verge of obsolescence. However, considering that the fighter first flew sixty years ago, it is hard not to be impressed by its longevity. Looking at the lifespan and capabilities upgrade of the LanceR compared to the original MiG-21F is also sobering when considering that today’s new fighters will have a lifespan at least as long, with all the changes that entails. Dassault was heavily present throughout the weekend, as, despite not bringing an aircraft, they brought a serious amount of brightly orange baseball caps, whit my guess being these easily outnumbered the total amount of caps handed away by all four other HX-hopefuls together. There will be more info on the Rafale with regards to the HX in a later post (as will be the case for Lockheed-Martin’s offering as well). The solo-Hornet was another crowd-pleaser, with the wet conditions providing for an impressive amount of vapour during its hard turns. While the IOC for HX might still seem far away, there isn’t too many air shows left before the F/A-18 will be relegated to second place. The first of the Finnish Border Guards new AS332L1e Super Puma helicopters demonstrating the Bambi-bucket. The Eurofighter Typhoon returned to Finland for what is only their second visit here so far. The unremarkable looking pod on the wingtip actually holds, amongst other things, two Towed Radar Decoys, which can be streamed after the aircraft to fool radar-seeking missiles. Contrary to my first guess, the system is actually robust enough that deploying them does not incur any kind of restrictions to the aircrafts flight envelope. The deployment of these can be controlled either manually or automatically by the integrated DASS EW-system. The Swedish Hkp 14 next to its Finnish cousin the NH 90 TTH. 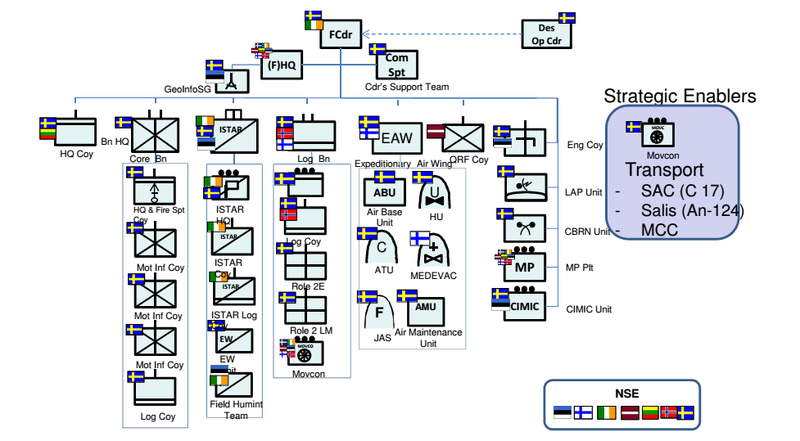 Sweden is currently the framework nation for the European Union’s rapid reaction forces’ Nordic Battle Group 15 (NBG15). As the battlegroup is a prioritized project in Sweden, symbolizing the “new” generation of security policy, wherein the defence forces were to be employed largely for different humanitarian tasks abroad, the fact that the battlegroups have never been activated for a “proper” mission is something of an embarrassment for certain parts of the political spectrum there. As such, there are now persistent rumors that Sweden is pushing for sending the forces abroad, preferably to some suitable African conflict. The fact that South Sudan, Mali, Central African Republic, the Democratic Republic of Congo, and Libya have all been mentioned, underlines two important facts, namely that there have never been any shortage of “suitable conflicts” for the battlegroups, and that for the current political campaign the priority seems to be on getting to employ the battlegroup, rather than having started by identifying a proper need, and then activating the battlegroup to fill this need. On the internet, the debate has been raging on in Swedish security and foreign policy circles on both twitter and blogs, with Patrik Oksanen (who also have included selected tweets by others), former FM Carl Bildt, Johan Wiktorin, and Reservofficer, all posting well written analyses of the situation. I will here focus on lifting the issue of possible Finnish participation. Order of Battle for NBG15. Source: Swedish Defence Forces. When looking at the order of battle for NBG15 as a whole, it is clear that Finland is supplying a rather small but specialized piece of the puzzle, in the form of the unimaginatively named FIN Helicopter Unit, part of the Expeditionary Air Wing (EAW). This consists of four NH90 tactical transport helicopters with medical evacuation (MEDEVAC) as their main task, together with a maintenance and support organization. In total it consists of four helicopter, 13 ground vehicles, and slightly fewer than 70 servicemen. 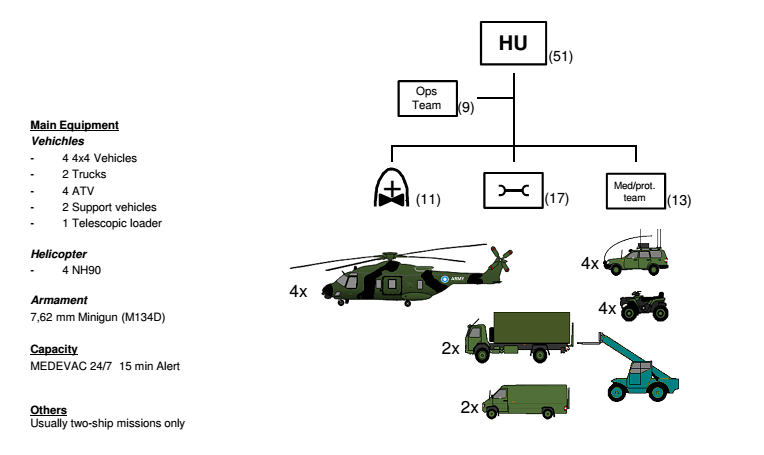 Composition of FIN Helicopter Unit. Note that the Finnish Defence Force gives total manpower at around 70. Source: Swedish Defence Forces. International operations of different kinds are one of the three main tasks prescribed by the law to be handled by the Finnish Defence Forces. However, it has something of a special status, as the operations are manned on a completely voluntary basis as they appear. Last Saturday, January the 3rd, Brigadier general Petri Hulkko wrote a column in Finnish regional newspaper Itä-Savo, where he called for making international missions mandatory for contracted soldiers. This created some stir, with Upseeriliitto (the Finnish Officer’s Union) stating that other solutions are readily available, and noting that supply/demand-issues are rarely satisfactory solved by legislation. However, a number of individual officers also spoke out in favour of Hulkko’s proposal. 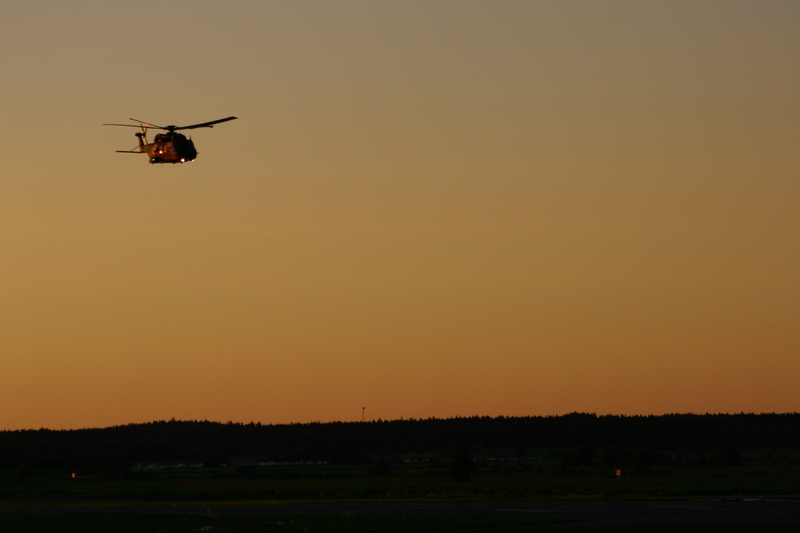 This debate serves as the backdrop for today’s article published by Helsingin Sanomat, where it is noted that one in five of the allocated personnel of the helicopter unit have expressed that they are not willing to participate in a foreign deployment. The problem is that unlike traditional “Show of flag” missions that employs large numbers of people to maintain a visible presence, positions such as helicopter mechanic demand proper qualifications, and cannot easily be filled by volunteering reservists or civilian contractors. This puts the whole participation of FIN Helicopter Unit in a possible deployment of NBG15 in doubt, which would not only cause considerable embarrassment for the Finnish political leadership, but also add to the logistical problems of the battle group as a whole. The FIN Helicopter Unit fading away into the sunset? Source: Author.